1. To cope with the lack of oxygen on Qinghai-Tibet Plateau, the train cars have been equipped with 2 oxygen supply systems. One is a "dispersion-mode" oxygen supply system, with oxygen spreading in the railway car through the air-con system; the other system, like that of an airplane, offers each passenger individual access to oxygen, and passengers suffering breath difficulties at high altitudes can use a pipe or mask to take more oxygen. 2. 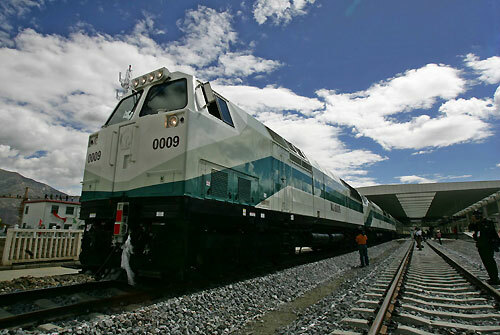 The trains running on the Qinghai-Tibet Railway are driven by 3 computerized engines at one time (made by US-based General Electric or home-based Dongfeng Locomotive Factory), which show great traction, brake power to guarantee the reliability and comfort. 3. The carriages are more spacious than other regular Chinese trains. Mostly manufactured by a Sino-Canadian joint venture, Bombardier Sifang Power Transportation Ltd (BSP), each carriage offers 98 seats at hard seat class, compared with 108 in a standard hard-seat carriage. 4. The train cars are installed with double-paned windows and UV filters to protect against ultraviolet radiation. 5. 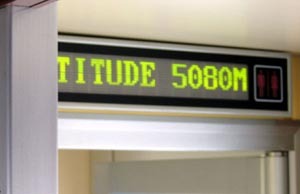 Based on the rule, each train has a doctor attending the medical emergencies of the passengers suffering from altitude sickness. 6. An advanced thunder-prevention system is installed in each train to guarantee the safety of the trains running on the plateau. 7. All the train cars were installed with environment-friendly toilets, wastewater deposit tanks and garbage treatment facilities to protect environment along the railroad. 8. The trains are more humane-designed compared with other regular trains in China. In the hard sleeper class, there finds one handicapped toilet in each car. Passengers can enjoy the 8-channel flat-screen TVs and remote-control devices to regulate temperature and lights at soft sleeper class. 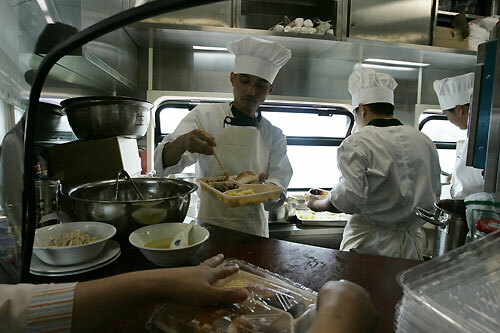 There is a mini-bar in the dining car (Alcohol is not recommended in high altitude). 9. All the attendants took training sessions before working on the train: simple Tibetan language and ethnic traditions, crash courses in English.